Google Chrome users are in luck. A new extension has been added to shed yet more seconds out of your online searches. Last year the company introduced Google Instant, where typing in search queries would show results instantly while typing. Then they introduced Instant Pages, a feature found in current versions of the Chrome browser that loads certain pages of your Google search results in the background making them instantly appear when you click on them. 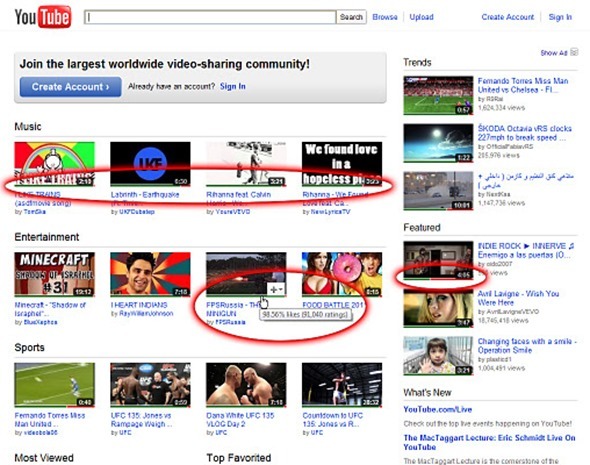 This new extension which we’re going to cover today speeds up YouTube searches. We’ve all been there; we search YouTube for that walkthrough or preview or clip only to find out there are dozens of them with similar titles. The next step would be to click on each video and hope the quality is acceptable or if it even relates to what you’re searching for. This problem is solved with the extension YouTube™ Ratings Preview. Throughout all of YouTube, you’ll find a small thin bar underneath each video snapshot. This bar will differ with each video showing a green (positive) vs. red (negative) color along its length. Higher rated videos, for instance, will have the most if not all of the entire lower bar showing green. Like any new software, there are a few known issues; Featured videos on YouTube are not currently supported and will not show a rating bar underneath. If you are searching YouTube for a lengthy amount of time, the bars will start disappearing due to YouTube’s API quota being met. The only solution to this would be to wait until they appear again. As a casual YouTube user I gave it a shot. After playing with the extension for a while I would have to say I’m impressed. It’s a must have for Chrome users out there.